Beaches and shorelines are shaped by the erosion, transportation, and deposition activities of waves, tides, and currents along the coast. These areas contain important ecosystems called estuaries. Shorelines and beaches are affected by changing sea level. • Erosion occurs when waves pick up and move sediment. Storm waves often erode beaches and dunes. Waves can erode beaches. 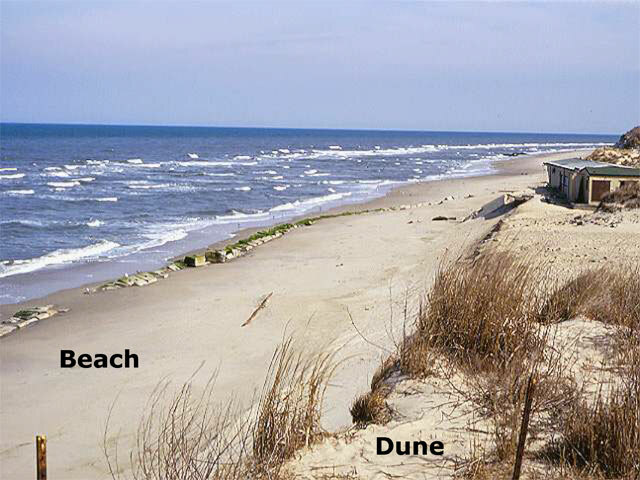 At First Landing State Park, shown above, dunes protect against shoreline erosion. Storm waves can wash through and over dunes. • Currents, such as a longshore current, also move sediment along the coast. The longshore current transports sediment along the coastline. Structures called groins, shown here, are sometimes built to trap sediment carried by the longshore current.